One of my main peeves with science is that it pretends to equal progress, yet it often lags it. Case in point is this recent article in Nature on the bicycle. Even though humans have been riding bikes for the last 150 odd years, humanity has only recently discovered how the bike actually works. Scientists from Cornell University were able to design a to wheeled prototype, which was able to keep itself in balance, and correct its’ balance when nudged. An interesting find! Of course there is a lesson in this for value chain development. We tend to over-rely on science to tell us whether interventions in value chains work or not. Certification is such an intervention, and very important one as a lot of public value chain development money is pumped into the certification tool. The business case for certification is a meek one. 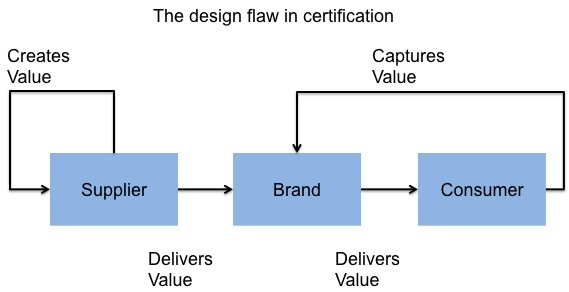 Certification by design is a construct which above all enables the lead firm to capture value. It leaves the onus of compliance with its suppliers, who remain only with permission to supply. Just check out the following variation on Business Model Zen: obvious why this will never work, isn’t it. Science is currently very actively busy in creating impact assessment methodologies to obtain proof how the certification system works. But just by observing the design of certification as a tool for achieving sustainability progress in business as in the figure above, it is evident that science is actually working on providing an answer why and how certification is not working. A valuable insight, but it feels like the bike. We take from science what we can use to design ways forward. We work on the basis of inspiration gained through business and value chain problem solving. We work on the next ideas, which move beyond certification, but are able to deliver on the same ambitions: transparency, sustainability performance standards, and greater equity in value chain relations. We bridge the gap with science by providing access to the data we are able to register in working on problem solving.